Chamomile is one of the oldest herbs still very popular around the world today. It was first used by the ancient Egyptian as medicine. Chamomile is often sipped for relief of ailments ranging from toothache to insomnia. Many people today use this herb as both a remedy to relieve anxiety and as a tisane herbal tea for enjoyment. The chamomile infusion has a floral aroma and fruity apple taste. Since it is caffeine free, it can be enjoy during any time of the day. OK, I am kind of iffy when it comes to chamomile. I’ve liked many blends that I’ve tried that contain chamomile, but when it comes to chamomile on its own… well, I’m not usually a big fan. Sometimes I do come across a chamomile that is pretty good – and yes, I’m saying that some chamomile is better than others. Some tea companies seem to demolish their chamomile buds, turning the little golden blossoms into dust. The resulting brew from the chamomile “dust” is not very good. As a general rule: the larger the chamomile flower, the better tasting the tisane it brews. I am usually very hesitant when it comes to trying plain chamomile (to the point of trying to find someone else to give it to! ), and I generally cringe when I receive chamomile as a gift or a sample. And when I received this sample from Enjoying Tea – I did cringe. And I did hesitate when it came to trying it. When I opened the tin, the chamomile blossoms were fairly large and there was very little pollen-y dust. Feeling slightly more confident, I measured out the chamomile and put it into my smart tea maker, and poured in the hot water and allowed it to steep for 6 minutes. The liquor is a lovely golden color – and it possesses a beautiful, inviting fragrance. And you know what? This isn’t bad – not at all! The flavor is slightly fruity (similar to an apple taste) with very subtle floral notes. It is a very serene flavor – and I do feel calmer and more relaxed as I sit here, sipping it. It’s nice. As I continue on this journey as a tea drinker (which I hope will be a life-long passion!) I am discovering more and more about myself. I am learning more about the proper way to brew teas, and in brewing teas properly, I am learning that teas that I may have thought at one time I did not like, I actually quite enjoy. 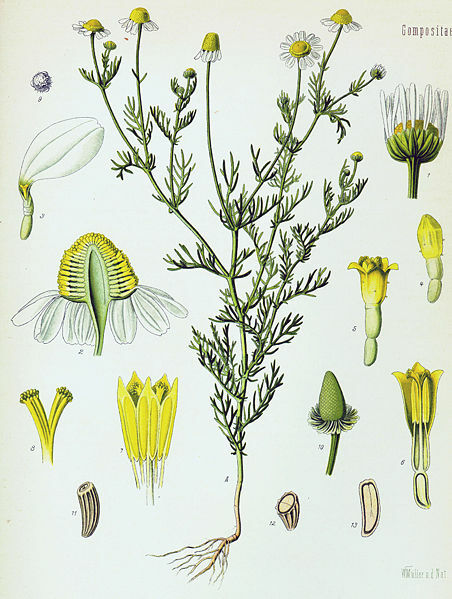 This Chamomile is an example. I used to brew all my herbals using boiling water – only within the last two years have I discovered that most herbal teas are better when brewed at a slightly lower temperature (just below boiling). Perhaps it was my brewing method that caused me to dislike chamomile so much. Because as I sit here, sipping this cup of Chamomile, I am thinking that I’m really enjoying it. It’s actually quite good! These are words I never thought I’d use to describe chamomile! But there it is. I like this Chamomile Tea!